Whether you are sailing the 27 or the 50, every Hunter is designed to be easily handled by one or two people. The deck layouts, sailplans, and standard equipment are designed and selected to make sailing easy and fun no matter what the conditions. Experience it for yourself by arranging a test sail with your local dealer. High freeboard, a raised boom and unsinkable ACP construction make the 146 a safe, versatile boat that the whole family will love. Standard roller furling with a large mainsail makes sail handling a snap. The Hunter 170's fantastic open transom design allows for super easy land or water access! In addition, the canvas cuddy unsnaps for easy bow access. The extraordinary seven foot beam keeps you stable, with seating for six in the clean and clutter-free cockpit. It's an original sailing classic! With over 80 active fleets and more than 3,000 JY15s nationwide, you'll never have a problem finding a race to get your adrenaline pumping! The ultimate daysailer with great overnighting capability! The ACP-constructed 216 is the largest thermoformed boat in the world, and won the NMMA's highly-coveted Innovation Award in 2004 for its pioneering design and construction methods. The all-new Hunter 25 sets a new standard for quality and features in its class. The Glenn Henderson-designed fiberglass hull and sail plan is simple to sail, and its fixed shoal keel draws only 2 feet. This makes for excellent shallow-water launching and sailing capability. This pocket cruiser sleeps four adults, has a compact galley and enclosed head. Best of all, skippers of all ages will find it fun to run. Novice sailors and veterans alike appreciate a boat that is easy to sail, packed with extra value and offers plenty of performance. Hunter’s exciting 27 delivers all that and much more, resulting in an exceptional weekend cruiser with all the comforts of home. An impressive interior incorporates a refreshing sense of spaciousness with its large salon and 6’2” headroom. Novice sailors and veterans alike appreciate a boat that is easy to sail, packed with extra value and offers plenty of performance. Hunter’s exciting 27X delivers all that and much more, resulting in an exceptional weekend cruiser with all the comforts of home. An impressive interior incorporates a refreshing sense of spaciousness with its large salon and 6’2” headroom. Maximum efficiency and comfort has been built into the interior of the Hunter 31. The forward cabin is larger than those in most boats of this class, achieved by adjusting the forward hull shape without affecting performance. A private aft cabin is also provided, along with an enclosed head with vanity and shower. Taking its celebrated hull design from the proven running bottoms of its larger 41- and 44-foot sisterships, the Hunter 33 imparts the best in performance without compromising one inch of interior space, resulting in a top-of-the-line midsize cruiser that has it all. The deck features an entertainment-ready cockpit with a drop-leaf table, surrounded by plenty of built-in seating for friends and family. Borrowing heavily from the ideas of Hunter owners, dealers and prospective customers, the popular 36 represents the end collaboration of enthusiast feedback, brought to life by the hands and minds of Hunter engineers. The extra wide beam spans nearly the entire length of the boat to maximize both topside and interior accommodations. The Hunter 38 was designed as an exceptionally comfortable cruiser with outstanding performance and easy handling. The sail plan features a large roach mainsail with flaking system and an anodized B&R double spreader fractional rig with struts on a conventional mast, or the easy-to-sail Selden® furling system. Choose the Hunter 41AC and be prepared for sailing ease with performance – and your choice of sail plans complemented by superior exterior safety features. Strategic rigging placement keeps the deck clean while the standard cockpit arch positions the traveler up and out of the way while also providing bimini, stereo speaker and overhead lighting connections. Choose the Hunter 41DS and be prepared for sailing ease with performance – and your choice of sail plans complemented by superior exterior safety features. Strategic rigging placement keeps the deck clean while the standard cockpit arch positions the traveler up and out of the way while also providing bimini, stereo speaker and overhead lighting connections. The new Hunter 45 has redefined the DS concept with the brightest and most open salon ever designed. Oversized deck ports draw in huge volumes of natural light to complement the rich woodwork and airy plan, and the wraparound windshield dominates the sleek and imposing exterior profile. A luxurious passagemaker with a versatile floor plan for total extended offshore cruising, The 50 offers a complete range of live aboard accommodations and outstanding entertainment features.With an overall length of 49 feet 11 inches, plus a 14 feet 5 inch beam and 6 feet 9 inches of salon headroom, the 50 is a BIG boat with impressive interior volume. The brand new 45 CC is a breakthrough boat that definesa Hunter center cockpit cruisier. It combines all the comforts of a center cockpit cruiser with an exciting European look, surprising performance and great value in a long-range package. 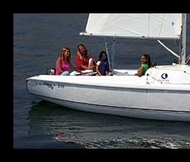 The 45 CC includes multiple ease of sailing features that have become Hunter trademarks, such as the backstayless B&R rig and cockpit traveler arch.